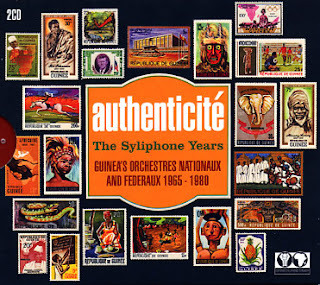 Authenticite - The Syliphone Years is an amazing 2-disc collection of music coming out of Guinea between 1965-80, when according to the liner notes "a new nation asserted itself and placed music at the forefront of its identity." lots of weaving reverbed-out guitar and sax, serious issues discussed with a party atmosphere. The Triffids - In the Pines the one Triffids reissue i hadn't picked up yet because i remember liking it the least, but it's effing great like all the others. radically different (ie non-slick) versions of many Calenture tunes. White Stripes - Icky Thump still digesting this one, but i can't get track 2 - "You Don't Know What Love Is (You Just Do As You're Told) outta my head. i know they're fully invested in The Schtick, but i think i'd enjoy the records better without it...but that's my problem i suppose! "We went to a Brazilian restaurant that was really good. I usually hate it when there is fruit with my meal but there was the orange slice that came with my meal and I just happened to try it in the middle of me chewing my other food and it was delicious." good stuff and things are looking up for Jailblazers fans. some new telephone hits the shelves today. tech writer Steven Levy likes it, and he also likes Portastatic so of course i trust his opinion implicitly... but still, $600? and you still have to have an ipod due to memory on the phone not being all that? eh. maybe i'll wait for Mach II. driveway to driveway, animated airplanes, package thief, seed toss, untied, misfits & mistakes, so convinced, european medicine, sick to move, kicked in, hellow hawk, punch me harder, slack. encore: throwing things, hyper enough, precision. the LA Record covers Crazy Tony but doesn't understand why people are into superchunk -- "Pavement, maybe, but Superchunk?" i know where you're coming from, girlfriend. parents, brother Brian and sister Liz, other friends and relatives of Sean's, and to raise some cash for research and support for others with the same type of cancer that Sean had. heading to NYC tomorrow for the McCarren Pool Party on Sunday -- it's free but you're supposed to RSVP HERE. see you in the pool! Wednesday June 20th we'll be playing at the Metro in Chicago as part of the Eff Cancer benefit concert dedicated to music fan Sean Silver... the show will also involve the fine musics of Mountain Goats and Ponys. 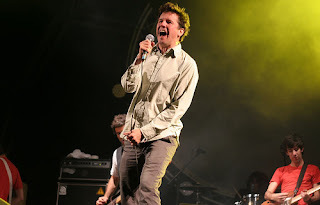 Sunday June 24th Superchunk will be onstage at the McCarren Pool in Brooklyn as part of their Pool Parties along with Oakley Hall and +/-, who were great when i saw them at SXSW this year. hope to see you at one or both of these rock concerts! on the evening of the Portastatic show at Primavera Sound, Jim Wilbur and I also performed a rollicking version of Precision Auto with our Spanish pals Half Foot Outside. 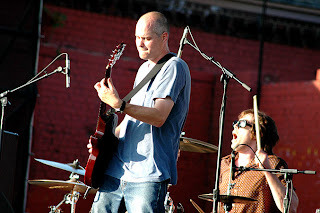 for some reason i have no photographic evidence of Jim being onstage -- is he a vampire? does he refuse to be photographed playing a cream-colored guitar? i can't answer those questions, but here's me hollering...i really had to concentrate harder on getting the words right without a guitar to play. also on my dance moves. Wilco mode, especially the first song "Either Way" and "What Light." i also like the "weird Wilco" of Ghost, Yankee, etc which wasn't really that weird at all, but much of this album sounds more natural to me. damn i wish i woulda seen this band at Primavera. 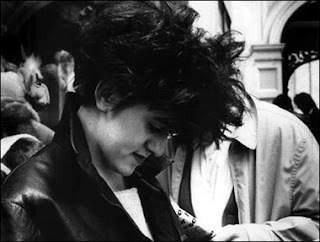 Tracey Thorn - Out of the Woods psyched to see this get a domestic release. ever since the Marine Girls , i've been pretty much "gimme some Tracey Thorn" from the wispy indie days through the Everything But the Girl (nice splash page there, btw!) disco nights til now. this is still on the electronic tip but some of the keyboard sounds could almost be tounge-in-cheek...a bit lighter in mood than some of the later EBTG. Thorn's voice always manages a great balance of detached and wounded. i just saw on the EBTG site that the b-sides to her new single are Magnetic Fields covers, you can hear 'em on her myspace page and they sound Magnetic Fields-y. Electrelane - No Shouts No Calls whereas i often prefer my metal instrumental, i like my Electrelane with singing and there's more here than ever. earlier records i enjoyed but didn't engage me like this one, which seems less controlled, more propulsive, and with the aforementioned vocals carrying the hooks along. immediate and lovely. well that wasn't much of a Game 7 last night, and the Senators historical comeback i was hoping for didn't happen. the Ducks of Anaheim took it to them from minute 1 and any time the Sens would get close something horrible would happen like the bizarre "hey Ray, it's Chris Phillips here, there's something caught in your skate...oh, it's the puck...oh, it's in your own goal" goal in the 2nd period. oh well, exciting for Anaheim fans like Snoop Dogg, and i do like Teemu Selanne, i mean the name Teemu Selanne -- it's a cool name. he seems like a good guy too and he looks better with his playoff beard. now Anaheim fans, like Carolina fans here, can spend a year hearing about how no one but them cares about the Finals when they don't involve the Red Wings or Rangers, but you know what? it won't bother them because they have the CUP. the lobby in the hotel was always a hilarious scene. went down for coffee the next morning and saw Steve Diggle talking to Johnny Marr. almost asked Marr "hey how do you play that little thing in 'Ask'? we tried doing it the other night and...etc" but thought better of it. Saturday night had a fantastic lineup as well but some stomach-related illness, plus an early shuttle to the aeropuerto the next AM kept me from ever getting back to the festival site. 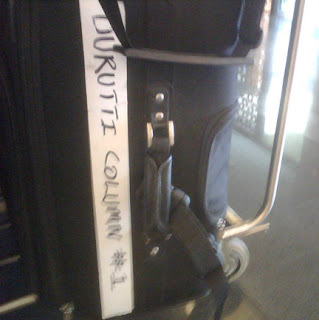 i was especially sad not to see longtime favorites The Durutti Column (though i did get a picture of Vini Reilly's suitcase, see above), Sonic Youth doing Daydream Nation, and Wilco, who i heard was great. what a great city, ate well, took a couple dips in the cold and extra-salty sea, hopefully we'll be invited back sometime!